Salzburg is famous for being the birthplace of Mozart. If you visit this beautiful Austrian city, you will notice that a lot of reminder are retained, pointing out that this city was home to one of the greatest composers and musicians in the history of mankind. In fact, most of it is done for commercial purposes. The Museum of Wolfgang Amadeus Mozart in Salzburg is remarkable, but against an entrance fee. Chocolate products under the name of the composer are incredibly tasty and you can find them everywhere in Salzburg. On top of most cafes, museums and shops, the sounds of Mozart can be heard. 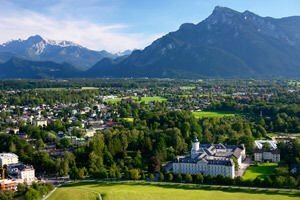 Salzburg is located in western Austria, it is a major center of the province. After Vienna, Graz and Linz, Salzburg is the fourth largest city in Austria with a population of about 160, 000 inhabitants. According to unofficial data, however, the number of people living in Salzburg reaches far more than 200 000 people. Salzburg is a popular resort town, which lies at the foot of the Alps, between Bavaria and Tyrol, on both sides of the river Zaltsah, or Salt River. The patron of Salzburg was a monk named Ruport, which in the 8th century, based the monastery "St. Peter" on a cliff and Christianized the population. In 798 the town received status “Arch Episcope” and became one of the ten major cities of Europe. The city name translates as "Castle of salt." Salzburg is impressive with some of the most picturesque medieval streets and magnificent palaces. Here is the palace "Mirabell" whose park is one of the finest in Europe. It is located on the opposite bank of the river. Built in 1606 the castle "Mirabell" in Salzburg was built by Wolf Dietrich for his mistress and their children. The building of the University of Salzburg was built in 1623. As a preliminary stage of the university, a high school was opened in 1617, as previous attempts had failed due to lack of land. In 1622 the school became the University of Salzburg with a psychological and theological faculty. This establishment is an essential part of the anti- reformatory policy of the princely bishops, which led to better education of priests. From 1772 to 1803, during the reign of Archbishop Franz Josef Colloredo of Walsee and Melz, Salzburg had become the center of the late Enlightenment. The school system was reformed in the Austrian model and brought numerous scholars and artists to Salzburg. 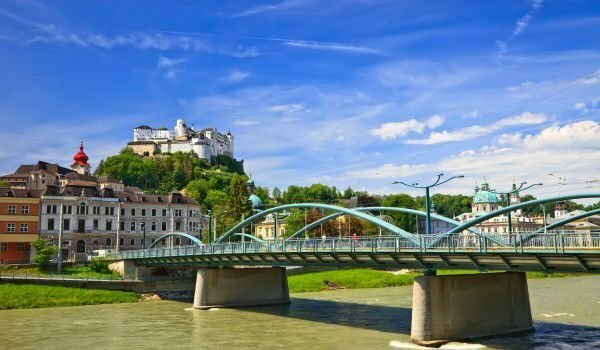 It is often called the "City of Mozart" because, as was already mentioned, the genius composer is the emblem of Salzburg. Mozart's Birthplace is now a museum. Every year in November is held the Salzburg Music Festival. The chocolate industry’s Mozart brand was launched in 1890, when Paul Fyorster creates candy "Motsartkugeln" stamped with the composer’s face. In November, Salzburg becomes briefly in one of the world's musical capitals. This happens because the annual festival. It is believed that the Salzburg Music Festival comes up with the most expensive tickets in the world and with a strong presence of the financial and political elite. The festival is visited by the Vienna Philharmonic, Berlin Philharmonic, Dresden, etc. The old town of Salzburg is located in a beautiful area between the river Zaltsah and Mönchsberg, the river separates the old from the new Salzburg. Above it stands the beautiful and majestic castle Hohensalzburg, It was built for princes and archbishops, today it testifies to the lavish and opulent lifestyle that they lived. The extremely beautiful building of the castle can easily be measured in beauty with amazing views, which open to the vicinity of the high hill on which it is located.